GPS Repeater Kits come with all you need for a straightforward installation. FalTech can recommend an experienced installation company if required. Installation report with photographs and technical descriptions. 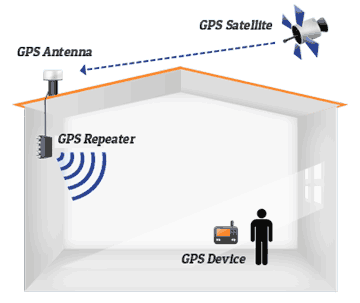 A GPS repeater system (sometimes referred to as a GPS re-radiator) is used to bring satellite signals indoors, providing positioning and timing signals inside areas where not usually present. Our customers use indoor GPS coverage solutions in a wide range of applications from commercial electronics test and repair facilities to emergency vehicles being kept “on the grid” when inside fire, police or ambulance stations. Repeaters are available to cover the GPS L1 and Galileo band (1.575GHz), the GPS L2 band (1.227GHz) and the GLONASS band (1.602GHz). Most of the repeater modules are available in a choice of standard IP51 and waterproof IP67 enclosures. We have GPS repeater kits available that come with all you need to bring the signal inside your facility. For larger or more complex situations we will work with you to create a custom-designed system that specifically addresses your coverage requirements. Indoor GPS Signal: Who Needs It? 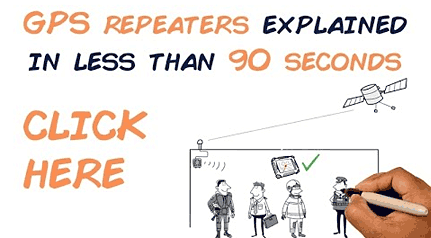 First – a GPS Repeater System is a device that relays GPS signals to any indoor location that isn’t normally reachable. An outdoor antenna picks up GPS satellite signals from your rooftop, and a coaxial cable carries the signal inside the building to a small, mains-powered, repeater unit. The repeater unit re-radiates the signal inside the building – so you have a strong GPS signal where it couldn’t reach before. Below is a small sample of some of our clients.